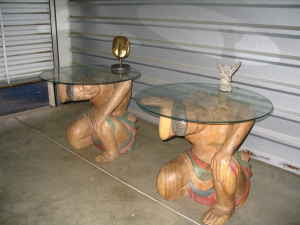 theAd>>These two Polynesian TIKI-MAN End Tables have circular Glass Tops and the Tiki-Man Statues for their base. Tikis= Tall, proud, god-like carvings that are used to mark the boundaries of sacred places. These End Tables= Degrading representations of an indigenous people that the Europeans nearly eradicated with desease and cultural oppression that mark the boundaries of your sofa. That looks great! Spacify offers wide range of End Tables.